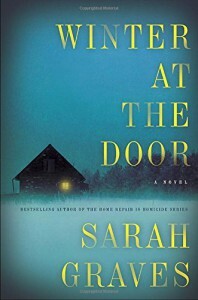 Winter at the Door by Sarah Graves is the first book I’ve read by this American author. It is also the first book in her Lizzie Snow series featuring a big city female cop. I was attracted to read this book because of the title, the cover and the blurb. More about this on the full review on my blog. The premise sounded good. Lizzie Snow, a homicide detective, moves to Bearkill, Maine where she will be given the mission of solving a series of suspicious suicides of local cops, that may or may not be murders. What the people of Bearkill don’t know is that she has ulterior motives for moving there: she’s on a personal mission to find her long lost niece. Sadly as much as I had high hopes for this female fronted story, it ended up not measuring to my expectations. Don’t get me wrong, it was not a bad book, but it lacked that oomph to make it one of those unputdownable and unforgettable stories. It was an OK read, nothing else. It started OK. The first few chapters are a good intro so you can get to know the weird people of Bearkill. I kept reading and after the first quarter of the story there were still no thrills, only a bunch of weird characters whose relationship to the murders was still a mystery to me. Half-way through, just when I thought the story couldn’t lack more spice it twisted into things that didn’t make sense. I kept hoping to be thrilled but at that point I wasn’t thrilled at all, just confused. And as the story progressed, I wasn’t fond of the sudden story-line changes. Once I was getting the hang of a story-line it changed into another one. I kept waiting for the thrills, suspense and mystery of and I quote: “a showdown that could leave the deep, driven snow stained blood red”, but that never happened. It turned out to be a predictable story in the end. And that last chapter felt like a terribly long afterword. I was glad when I finally ended reading this book. Like I said in the beginning, Winter at the Door is not a bad book. In fact there are some rave reviews about it out there. It just didn’t do it for me. But feel free to check it out as well as the second installment in the Lizzie Snow series which will come out in 2016.